Sanibel Island Real Estate, Captiva Island Real Estate - Sanibel Voted "The Best in the World"
Sanibel Voted "The Best in the World"
This week I added a terrific condo to my website condo pages. Tarpon Beach Condos are located on 2475 West Gulf Drive (Just east of where Tarpon Bay Road meets West Gulf Drive. This popular condo is direct Gulf front with easy access to miles and miles of Sanibel's best beaches! 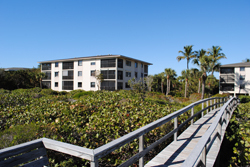 Tarpon Beach has 30 units and is a popular rental for visitors. A large pool, tennis courts and tropical landscaping adds to the relaxing atmosphere. Shopping and our best restaurants are only a short drive away! Check out my Tarpon Beach page and you can watch my short video of the property. As usual, I have the latest information on ALL properties available at this condo! Contact me! On a separate note, we now get to brag about what Frommer's travel guidebook says about our island - We were named as the TOP travel destination in the world! This is nothing we didn't know, but it sure backs up what we've been saying all along. Sanibel has it all: miles of bike trails, miles of beaches, golfing communities, tennis courts everywhere you look, and some of the most famous conservation properties (Like the Ding Darling National Wildlife Preserve)! Check out the video below from our local news station. Have a great day and I look forward to helping you find the best in Sanibel Island Real Estate and Captiva Island real estate!